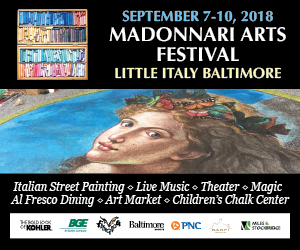 Festival Hours Friday, September 7 – Monday, September 10, 2018 11am-10pm. Kohler Information Center 9am “The Art of Copying” Copyright Breakfast Talk with James B. Astrachan, Esq. Roving opera singers, Kimberly Christie, Soprano and Jason Buckwalter, Baritone perform in and outside the restaurants 6-8pm. Park School of Baltimore a cappella ensembles, The Eightnotes and The Vocal Chords perform in and outside the restaurants noon to 2pm.